There is something special about this time of year. And for CEF and many other charities, Giving Tuesday Canada has a lot to do with the specialness of the season. Called the “opening day of the giving season,” Giving Tuesday is a day when nonprofits and businesses, as well as families and individuals, join together and rally for their favourite causes. November 28 is THE day of the year for the giving community: our Black Friday equivalent. Last year in Canada alone, 5,700 partners came together and millions of Canadians joined in the spirit of giving via donations, activism, and volunteerism. Entering into another year of Giving Tuesday, CEF is thrilled to join forces with long-time partner, Kids International Development Society (KIDS). We have partnered with KIDS on several past projects in Cambodia, such as a floating health clinic, a girls’ washroom, and new classrooms. In Giving Tuesday 2015, we had the pleasure of supporting KIDS and their program, Smart Kids. Two years later, we’re back supporting this wonderful program. Smart Kids is a youth scholarship program based in a rural area of Cambodia called Kompong Khleang. Selecting children that are the most in need, KIDS works with families to assist one child per family in pursuing an education. Taking a holistic approach to education, youth in the Smart Kids program receive school supplies, a school uniform, solar lights for home study, school fees, daily English classes, tutoring, and a bike to travel to school. To help the youth make the most of their education, KIDS also provides access to healthcare when needed. Reaching Adrianne and Rick in Cambodia, we asked them what Smart Kids means to the youth in the program. Most of the families in this area work as brick labourers or fish for a living, making very poor wages. Many of the parents are illiterate and have little or no opportunity to better their lives or the lives of their children. As a result, most of the children work part-time in the brick factories and, without an education, will continue to live in poverty. 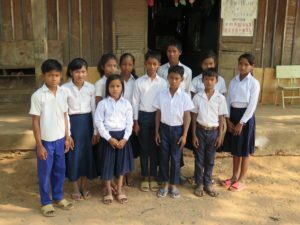 Through programs like Smart Kids, school builds, housing, clean water projects, floating health clinics, and solar lightings, Nanaimo-based KIDS is trying to make real change in rural Cambodia. The efforts of KIDS in Cambodia really resonate with CEF, as many of their projects meet our goals to provide good healthcare, education, and sustainability to impoverished regions around the world. KIDS play an important role in the lives of the children they help. More importantly, children love the opportunities KIDS provided to them. Described by one of the youth: “we love going to Smart Kids program because we work hard and learn a lot." To celebrate Giving Tuesday and the wonderful work of KIDS, CEF will match every one $1 donated (up to $3,000). For more information and to donate, visit http://bit.ly/2gdizjR.